The Kathmandu valley, the political, commercial, cultural hub of Nepal, is famed for it is natural beauty and history, holistically palace. 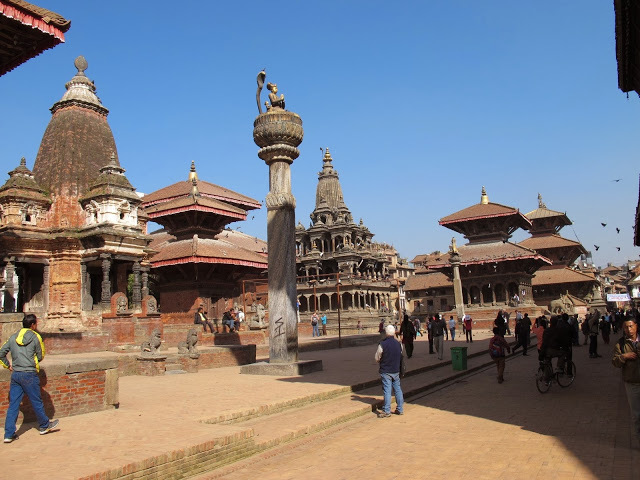 Once a separate kingdom in itself, it contains three fabled cities, Kathmandu, Patan & Bhaktapur. Each is an artistic exposition of graceful temples, elegant palaces, brick paved courtyards and quaint streets. As a whole, the valley is surrounded by tier upon tier of green mountain walls above which tower mighty snow capped peaks. The valley is rich in places of pilgrimage for both Hindus and Buddhists. Both of their deities well side by side by both Tantric symbolism and ancient animistic beliefs. Very old Hindu text has described the Kathmandu valley as the land of gods surrounded by beautiful mountain around. It is said that there were as many temples as there were houses and many idols as there were people. In fact Kathmandu boast, one of the largest congregations of magnificent historical monuments and shrines ever built. Here are some monuments well to visit. 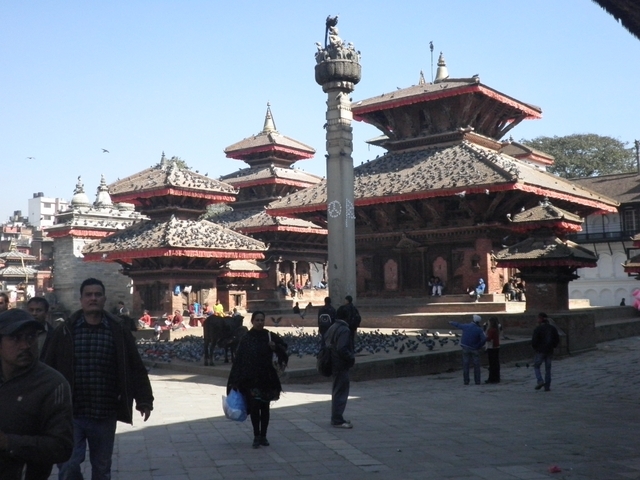 Kathmandu Durbar Square; duly recognized as a world heritage site by UNESCO, this particular area best known as Kathmandu Durbar Square lies in the heart of this city. The locals know this area by old name "Hanuman Dhoka" Palace Square an ancient seat of the Nepalese Royalty. 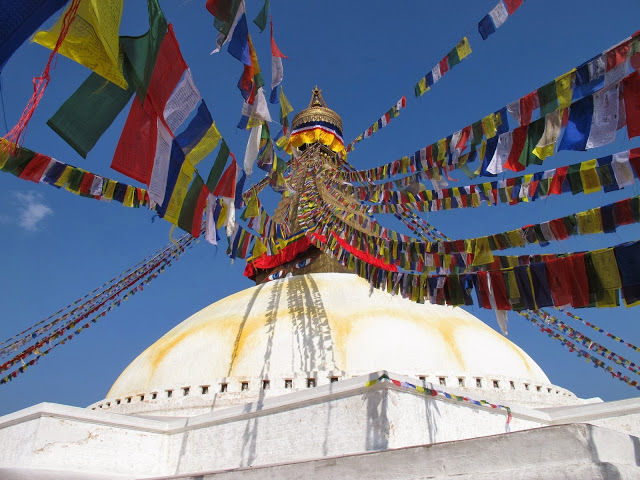 Swayambhunath Stupa; Three kilometers west of Kathmandu city complex locates world almost glorious Buddhist Stupa, Swaymbhunath stupa is said to be 2000 years old. Visitors often call it "Monkey Temple". The main structure brick and clay has supported a lofty conical spire capped by a pinnacle of copper gilt. There are the all-seeing eyes of Lord Buddha on the four sides of the spire. Being situated seventy meter above the level of the valley, the hill of Swayambhunath is a mosaic of small stupa and pagoda temples. Aside, in front of the Swaybhunath Temple, one of the famous goddess with the shrine of Ajima called "Harati Mata" is there. The Harte Mata temple of goddess believes to be famous in the way of Tantric. Both, the Stupa of Lord Buddha and temple of a goddess are surrounded by other temples and Tibetan monasteries. Being located in the top level of the valley, this place is famous for visitors for a sightseeing tour. Pashupatinath Temple; Pashupatinath temple being the temple of Lord Shiva; it is two-storied golden roof and silver doors and is famous for superb architecture. Pashupatinath temple is situated 5 kilometers east of Kathmandu heart, on the banks of sacred Bagmati River. Pashupatinath is a center of annual pilgrimage. 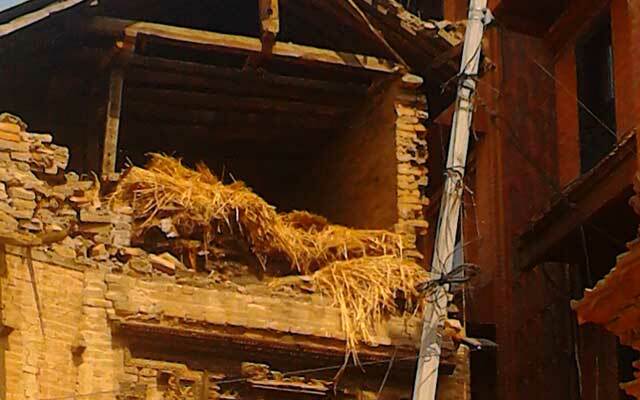 From time immortal, the Pasupatinath area has contained numerous temples, stupa, monasteries, images and inscriptions. Pashupatinath area is not a pilgrimage site for the Hindus and it is also an important cultural treasury of the whole world. Only Hindus are permitted to enter from the main gate to Pashupatinath Temple. 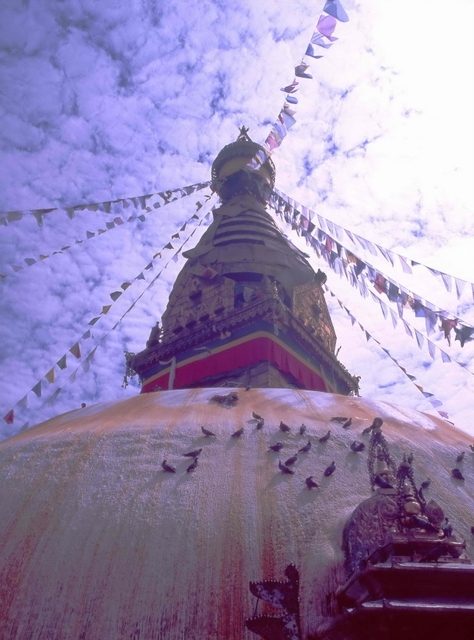 Bouddhanath Stupa; One of the oldest and the biggest Buddhist monuments ever built in Nepal. Bouddhanath is an imposing structure standing some 36 meters. Bouddhanath Stupa stands on the massive three level Mandala style platform surrounded by colorful private family houses. 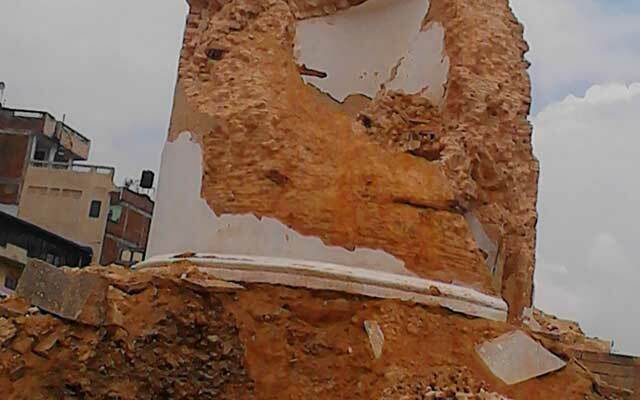 The basic feature of Bouddha Nath great Stupa is same like Swayambhunath stupa except it is finial displaying. It is much bigger than Swayambhunath Stupa and lies on the valley floor where s former stands on the hilltop. Bouddhnath stupa is said to have been built in the 5th century AD. Budhanilkantha Temple; Located here is a Deity of Lord Vishnu, Vishnu (Narayan) Jalasayana, lying on Ananta Sesa, in the cosmic ocean. The Deity is over 1,000 years old. 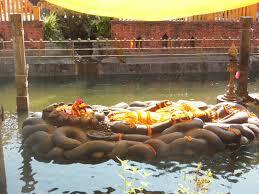 Lord Vishnu is about 5m (17 ft) long and is lying in a 13m (43 ft) long tank, as if floating, with His legs crossed. His four hands hold the four symbols of Vishnu: the Chakra (disc), club, and conch-shell and lotus flower. Budhanilkantha means “old blue-throat”. Ananta has 11-hooded heads. It is believed that the deity was carved in the 7th or 8th century during the Licchavi period. Hindus may walk down the steps and touch His feet, but foreigners cannot. Balaju Water Garden; Situated five kilometers northeast of Kathmandu, Balaju Water Garden is an ideal place for rest and relaxation. Balaju Park features a long line of twenty-two stone water spouts from the mid-eighteenth century, each of which is ornately carved with crocodile heads. The Balaju Water garden also includes many other ponds, some of them containing large and small varieties of fish. Adjoining the garden is an Olympic-size swimming pool open to the public. Kirtipur; is a small town, eight kilometers southwest of Kathmandu, on the top of a hill. Tribhuwan University is located at the foot of the hill. This historic town has many things to see such as old shrines and temples, old houses, and people dressed in traditional costume although working on ancient looms. Chobhar; is situated nine kilometers southwest of Kathmandu. This place is famous for gorge. All the waters of the Valley drain through it. Legends say, that the god Manjushree cut the gorge to drain out Kathmandu Valley that was then a lake. There is a small but picturesque temple of Adinath on the top of a hill. From this point, one has a complete view of snow-capped mountain peaks. Just beyond the Chobhar Gorge. There is the 17th-century temple of Jal Vinayak. The main image of the temple is on a massive rock. The image at Jal Vinayak is different from other images of Lord Ganesh. Dakshinkali; the temple of Dakshinkali is situated about 22 kilometers south of Kathmandu. Dakshinkali is an important place of pilgrimage, drawing over 400,000 pilgrims a year. Pilgrim visits this temple to offer prayers and animal sacrifices to the Goddess Kali. Apart from the religious aspects, the side has also been developed as a popular picnic sport. 1st day: Sightseeing in Pashupatinath Temple, Boudhanath Stupa, Monkey Temple, Budhanilkantha Temple and Kathmandu Durbar Square, 5-7 hours, transfer to hotel. 2nd Day: Sightseeing in Dakshinkali Temple, Chovar, Kritipur, National/ Natural Museum, transfer to hotel. Note: Tell us where want to visit. 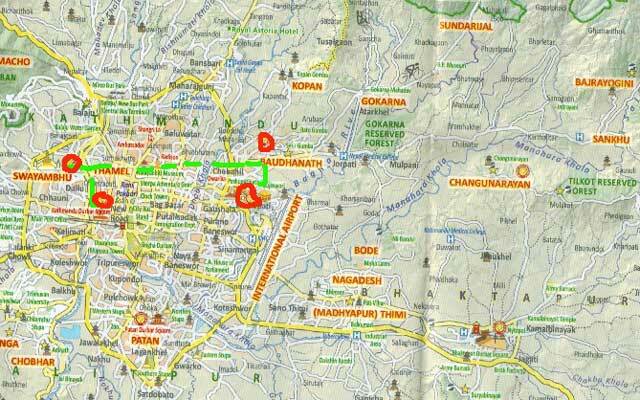 It is possible half day, full day, or few days to sightseeing in Kathmandu. The price is depend on group size. It is noticeable that every day is possible with joining group by tourist bus or individuals by private car/Jeep. Toyota/Indica Car or by Toursit bus. 1st day: Sightseeing in Pashupatinath Temple, Boudhanath Stupa, Budhanilkantha Temple, Monkey Temple and Kathmandu Durbar Square, 5-7 hours, transfer to hotel. If want to join with group, we operate daily group joining city tour by tourist bus its start at 10.30am. If using private Car/Van/Jeep, start as your own time. First we drive to Pashupatinath Temple, the Hindus pilgrims place where the death body burn. Second bring to Buddhanath stupa, which is one the biggest stupa in the world. Third, drive to Budhanilkath Temple, where you can see the sleeping God “Narayan”. Fourth, drive to swayambhunath its call “monkey Temple” and at last visit Kathmandu Durbar Squire, the old “historical palace” full day sightseeing 5-7 hours. If want to join with group, we operate daily group joining tour by tourist bus its start early morning at 6am. If using private Car/Van/Jeep, start as your own time. First drive to Dakshinkali Temple, 22 KM south of Kathmandu, takes one hour, return to Chovar, the historical hill. Visit Kritipur, the old city continues return to National and Natural Museum and visit Balaju water garden, transfer to your Hotel, full day sightseeing 5-7 hours.